This surprised me. What a strange result! I think it's off the mark but oh well. 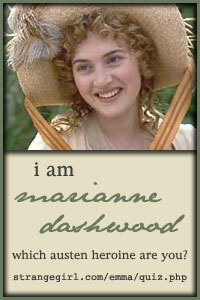 Marianne has always been one of my favorite Austen heroines. Thank God the results weren't Emma! I would have to seriously rethink my frame of life.